My name is Rose Anne MacDonald and I have a small kennel (Miss Mac's Boxers) located in Sydney Nova Scotia. I have 3 puppies from a litter my girl Nakhti whelped on December 13th. I have 2 females and one male. Puppies are getting their final vet check up and microchipping and will be available to go to their forever homes next week. New puppy families will receive a puppy that is vet checked, microchiped, vaccinated, a one year health guarantee for congenital health conditions and are registered with the Canadian Kennel Club and are born from Championship bloodlines. 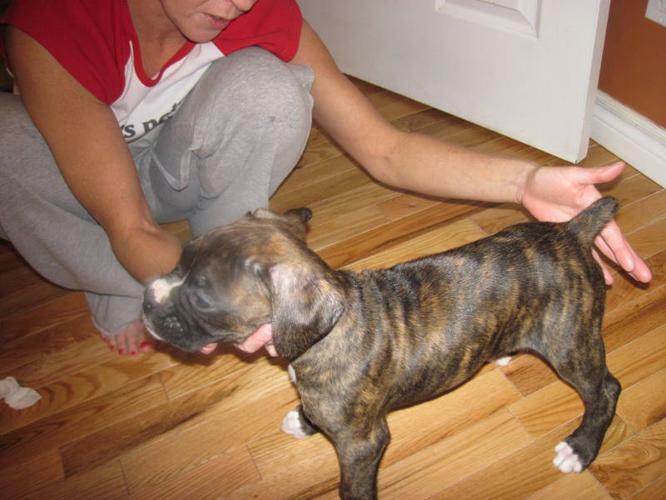 You will be provided with a 5 generation pedigree, and ongoing support from me, as a breeer, regarding training, grooming, health matters and any other issues about your boxer. I strive to ensure that I make the best match of puppy and family based on the families energy and the puppies personality..as they are all so unique. After you meet the puppy for your family you are encouraged to visit him or her and get to know them, name them, and meet their mother and siblings that are on site. You can also view and receive copies of (if you chose) health testing on the parents of the puppy. I ship out of province as well. Puppies require a $150 non refundable depost to secure your puppy. Male is brindle, the fawn and flashy brindle are female. PRUEBRED ROTTWEILER PUPPIES READY TO GO!! !